Windows 10 uses the Security and Maintenance screen to keep you informed of issues that pertain to your computer’s health. The screen divides issues into Security and Maintenance sections. The Reliability Monitor can help you pinpoint problems with hardware and software. In the System window, select Security and Maintenance in the lower-left corner. The Security and Maintenance window appears, as shown. Another way to open the Security and Maintenance window is to type Security and Maintenance in the Search box on the Windows taskbar. 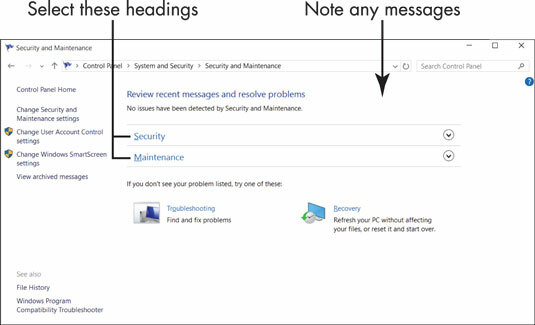 Note any message displayed under Review Recent Messages and Resolve Problems. Ideally, you see No issues have been detected by Security and Maintenance. If you see a message concerning a specific problem, select that message for more information. Select the Security heading in the Security and Maintenance window. Network Firewall: The firewall scans Internet traffic and blocks activity from programs that don’t have explicit permission to use Internet access. When you install a program that uses the Internet, you may be asked to approve the connection the first time. The safest practice is to reject online connections that you don’t initiate or recognize. Virus Protection: Having virus protection for your computer is essential. Windows Defender provides antivirus protection, although you can install some other antivirus program. Spyware and Unwanted Software Protection: If this service is on, you have basic protection from malicious software provided by Windows Defender. Internet Security Settings: These settings pertain to your browser. The default settings may be adequate. To learn more, see the following tip. User Account Control (UAC): This function notifies you of programs that try to make changes to your system and requires that you confirm any such changes. In particular, UAC lets you know when a program tries to run or install software that may be malicious. When in doubt, say No or Cancel to UAC messages. Windows SmartScreen: This function blocks you from downloading programs, except through the Microsoft Store, as well as files capable of changing your system maliciously. Microsoft Account: This one tells you whether your Microsoft Account is set up properly. Automatic Maintenance: Your computer automatically performs critical updates, security scans, and diagnostics each day. If your computer is in a guest room or bedroom, you may want to change the Automatic Maintenance setting to run maintenance tasks at some time other than the default 3:00 a.m. Your computer may actually wake up at that hour for maintenance (although, if your computer is connected to a power strip, you can turn off the power strip and prevent your computer from turning on automatically in the middle of the night). If the computer can’t run maintenance at the appointed hour, it will do so at the next opportunity. HomeGroup: A homegroup is a network that allows you to share files and printers between two or more computers. File History: File History is off by default. Drive status: Drives are hard disks inside or attached to your computer. Your documents, photos, and Windows 10 itself are stored on one or more drives. Ideally, the drive status is All drives are working properly. Device software: If a device on your computer needs a driver or other type of software to run properly, you are alerted here. Select Install Device Software to install the software. 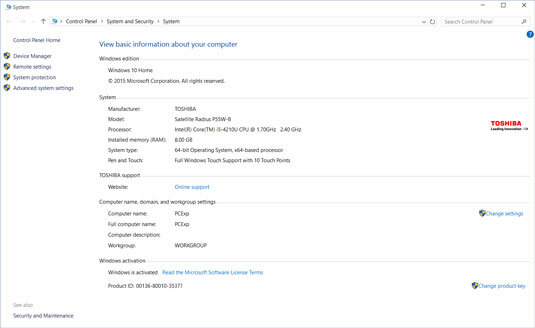 The Security and Maintenance window is a troubleshooting tool, so you should check it if you have problems running Windows 10. 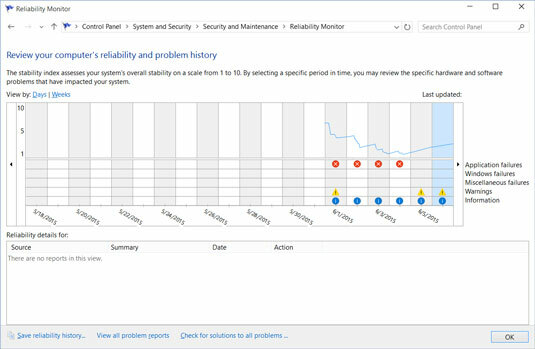 Under Check for Solutions to Problem Reports, select View Reliability History. As shown, the Reliability Monitor screen graphs your computer’s stability and indicates hardware and software problems, including those you may not be aware of. On this screen, red circles indicate critical events such as computer crashes; blue circles are information about software installation and updates; and yellow triangles indicate warnings about noncritical events (something that didn’t crash the computer). Select a day in the graph to display details in the lower portion of the screen. Reviewing the Reliability Monitor screen helps you distinguish between a one-time glitch and a recurring or worsening problem.